Sometimes Nirvana’s rise to glory is looked at as an inevitability. Rather it’s safe to say that as late as mid-1990 there was no guarantee the band was going to win a major label deal. Certainly the release of Bleach didn’t lead irrevocably to the triumph of Nevermind. Other steps intervened to make Nirvana into the band the world knows. I’ve deliberately not shown the actual figures for how many songs were written because what I’m interested in is the lulls not the activity itself. 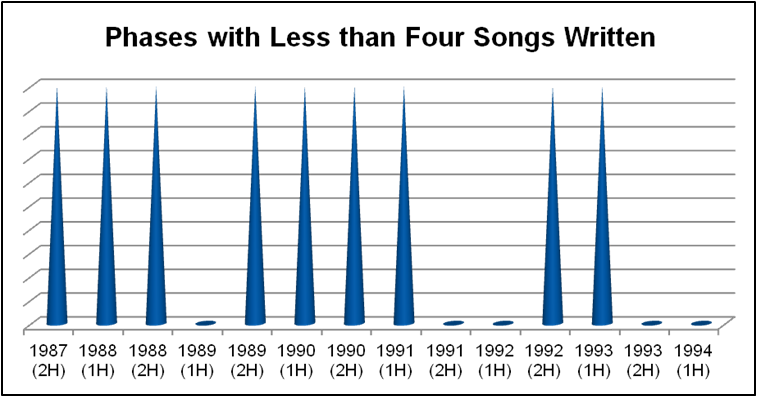 While 1993 and 1994 seem to have been even worse than 1992 in terms of the number of songs written, the overall pattern was at least in line with the norm for his working practices with lulls after each album. The lull in early 1989, during which Dive was the only song definitely written, is followed by a quiet spell throughout late 1991 and early 1992 during which Tourette’s, Talk to Me, Curmudgeon and Heart Shaped Box come together. The gap in late 1993 through early 1994, when only You Know You’re Right and Do-Re-Mi can be proven, isn’t exceptional when seen in these terms. It gives rise to two conclusions; firstly, that there’s a chance Eric Erlandson’s comments in March 2012 about unknown 1994 demos may carry weight. Secondly, that Kurt Cobain’s decline need not have been permanent barring his decision to make it so. In early 1993, Kurt relied on a bedrock of earlier material he could cherry-pick to bulk up In Utero to the twelve songs (plus bonus) he seems to have felt was ideal. He carried a full seven songs onto In Utero era releases. If he was willing to use Do Re Mi, You Know You’re Right, Talk to Me PLUS Verse Chorus Verse and Vendetagainst (Help Me, I’m Hungry), he would still have needed an exceptional second half 1994 to have an album ready to record in early 1995. At my estimate, the most Kurt wrote in a six month period was eight-nine songs ranging down to a norm of four or five. To get as far as an album recording in 1995 he would have needed to exceed his finest ever spells of writing which had been late 1990 and early 1991 (first and second best with nine and eight songs respectively.) It seems unlikely. Unless something extraordinary happened, or he’d pumped out a ten track album (which in Nirvana terms would have meant just a half hour or so of music) we wouldn’t have seen a new Nirvana/Kurt Cobain album until 1996 at the earliest. On the positive side, this isn’t an uncommon occurrence. Many bands lean heavily on material written prior to the heavy touring, TV and media engagements of fame in order to sustain them past a second major release. Likewise, it isn’t unusual for performing artists to drain the well of inspiration and need lengthy periods to recover some measure of creative flow. A drug-free Kurt Cobain looking toward the future could have had one…if he had wished. If he had, we probably wouldn’t even be talking about the lull in productivity 1993-1994, it would just be an irrelevant blip on the graph with no more significance than the ones after Bleach or Nevermind.